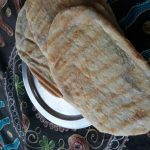 Laffa Bread is a traditional Middle Eastern Bread easy to make on the stovetop at home thicker and chewier than pita. The first time I saw the pictures of Laffa bread it was in Isreal at an Indian Restaurant! The bread looked so delicious and the locals told me that is a coummon bread there and is used to wrap meats like kebabs and shawarma, even to make a sandwich. Therefore, for this BM I opted for 1 alphabet and 3 countries. My alphabet is I and this bread represents Israel. The bread like all the other flatbreads we have start with flour, yeast, salt, sugar, water and oil. The dough rising time is 1 hour then once you form the individual balls the resting time is 10 minutes. Rest is like our Indian Chapati it is rolled out and cooked on the Tava but…. but the distinctive look and taste is by the scorch marks. Keep your pan very hot. Please excuse my pictures. I will make a fresh batch and update the pictures. Mix all the dry ingredients in a big bowl. Add the oil and water mix until until well combined and coming together. Turn the dough out onto a lightly floured surface and knead for about ten minutes until smooth and elastic. Place the dough in an oiled bowl and loosely cover with kitchen towel. Set aside for the dough to rise. Depending upon your weather the dough will rise in 30 minutes to 1 hour. When the dough has doubled, punch the dough down. Divide the dough into 10-12 equal balls, and then roll the balls until smooth. Place the balls on an tray cover them with a damp tea towel and let the dough balls rest for about ten minutes. Resting makes the dough easier to roll out. Pre-heat a tawa/skillet ( use the sandwich toaster with the grilling plate). Flatten one ball of dough with your hand and flatten it out on an oiled wood surface. Roll it out in a circle with a rolling pin(you can also use your hands). Roll out to a circle about 12 inches in diameter. Gently transfer to the hot skillet or the on the hot grill . You will need to turn the laffa when the edges look dry and the bread is poofing up turn it over. You will have to be quick as Laffa only takes a few minutes to grill. Store in a casserole lined with kitchen towel or tissues. Use as soon as possible as I find that they are much more tasty immediately. Serve rolled with cutlets, hummus, mayonnaise, salad. You will need to turn the laffa when the edges look dry and the bread is proofing up turn it over. You will have to be quick as Laffa only takes a few minutes to grill. Wow! This looks like our naan, right? My husband loves these middle eastern breads. Simple, everyday laffa bread — looks so soft and fluffy. Great to make falafel sandwich. Though I saw the grill marks,I was wondering whether this was an oven made bread. I bet they were good in those stuffed wraps. 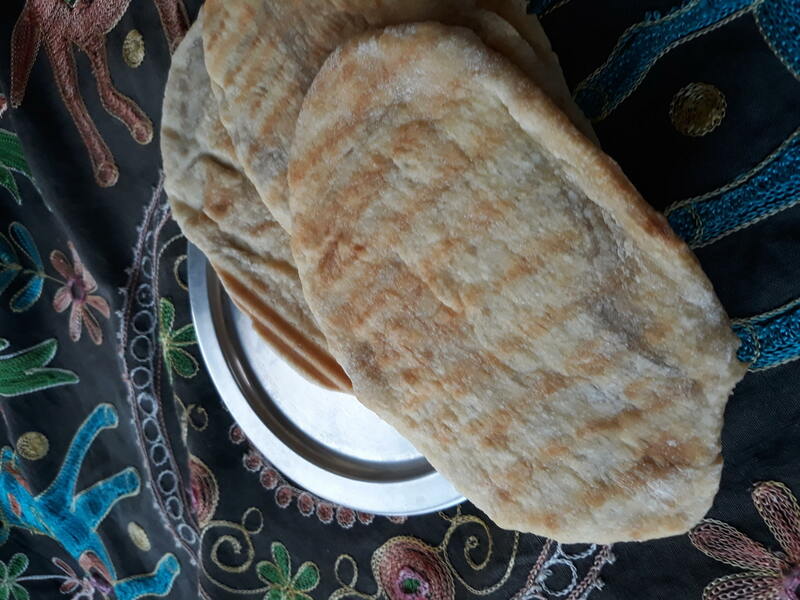 Laffa bread looks absolutely soft and prefect to make some filling sandwich without any hesitation. Middle Eastern breads are so delicious and different. You’ve made the luffa bread perfectly. Like how it can be cooked on a tawa. Laffa with those grill pattern on it looks so inviting Arch. What a wonderful meal it would make with fillings in it!